Stovington Wellesley Hadley, known as Wells, was known for three things....first being the youngest lawyer ever to make partner at Biddle, Carson and Delaney, secondly, his twohanded backhand and lastly, the fact that he was always perfectly dressed. No one had ever seen him even unbutton his suit coat. Ever. The reason for the first was graduating top 5 from Georgetown Law. The reason for the second was practice. Lots and lots of practice. The reason for the third, well......all through his years at Phillips Exeter Academy, amid all the lacrosse and crew, he had a secret wish. All through his undergrad at Yale, pledging the fraternity, spending a year abroad in Europe, he had a secret wish. Clerking part time through law school, spending lots of time on Capitol Hill, he had a secret wish. Spending summers at the country club, whether on the tennis courts or in the bar, he had a secret wish. Making partner, getting married, purchasing his brand new Mercedes, he had a secret wish. He had always wanted to be one of the Bee Gees. This was not something he shared with a soul. Not his prep school roommate, his nanny, or his wife. All throughout meetings, trials, depositions, Wells looked very preppy and conservative. 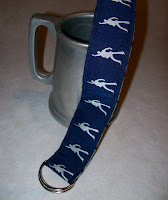 No one knew he was secretly indulging his fantasy by wearing his Boogie Fever belt. He could think about strobe lights, spandex and Stayin' Alive all day long and no one would be the wiser.